Clarets boss Sean Dyche doesn’t expect Burnley will break their transfer record in the January window, amid reported interest in Brentford’s £8m-rated midfielder Alan Judge. The 27-year-old former Blackburn Rovers man has already been the subject of a rejected bid from Championship rivals Sheffield Wednesday this month. And on Wednesday, Burnley were linked with the Irishman, who impressed in the Bees’ 1-0 defeat at Turf Moor in August. But, ahead of tomorrow night’s game at Brentford, Dyche, asked whether there was the potential to top the £6m paid to the Bees in the summer window, he admitted: “I sincerely doubt it. Speaking specifically on whether there was a deal in the pipeline for Judge, he added: “I have no clue of any deal that’s coming along for Alan Judge. Brentford are believed to value the player at around £8m, but Dyche knocked down suggestions Burnley would spend that sort of money: “£8million? This is Burnley remember. 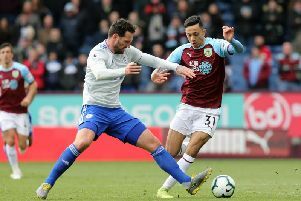 Burnley have tried to balance the books, while other promotion rivals are less frugal in the rush for the Premier League pot of gold, and Dyche added: “Other clubs in the Championship are bringing in zero and spending 15s and 18s and 20s so there lies the quite obvious challenge. It’s not rocket science. And the wages to boot. “We can compete in our world to a financial level and we still think that’s a decent level, but when you add in the wages – I know the wages in the Championship and some are unbelievable now. He added: “The last time I said that I got hammered for it, but I’m just stating a fact. There’s no angle to my words. I’m not against anyone who does it, I must make that clear. “It’s entirely up to every club and every owner. I’m merely stating a fact. Because I can assure you if the chairman said to me ‘here’s £30million to spend’, I’ll spend it. As long as the club could stand it, or the chairman could handle it personally, then I’d spend it. Fees are not the only consideration either, with wages a factor: “There would be (a wage disparity) here if we brought in a super elite player. If he was on massive money, there would be a massive gap. Meanwhile, he laughed off suggestions that Gray could leave this month, with national newspaper reports claiming Swansea City are preparing a £12m offer. While Gray could join another club in the transfer window, he would be unable to play as FIFA regulations prevent players being registered full-time with more than two clubs over a season. Dyche was amused by the report’s failure to grasp the rules governing transfers: “He’s not allowed to play for another team. “They know he’s not allowed to play for anyone else this season. “I do think it’s interesting, the number of people that keep asking me about Andre – he’s not allowed to move.